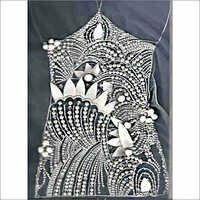 Our company has been the fore front of creating stunning form of beading, which is hand made, using pure Swarovski crystals, pearls, stones & sequins that is high in demand. Color: white, Blue, Red or could be available in any colors. 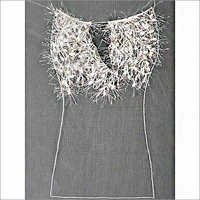 Fabric: American D. White Net. 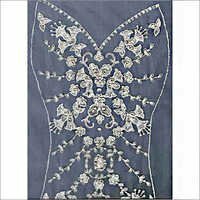 It is completely skilled hand beaded attractively embroidered & beaded gown iced with floral applique. 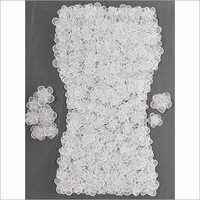 It is a beautiful floral design fabricated using plastic sequin in various colors. We being a client oriented company, look after all product specific requirements of our valued clients. 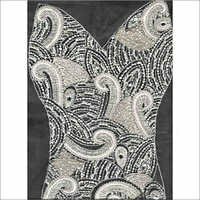 We are counted among the leading Sequin Gowns Bodice manufacturers, hence we lay immense importance towards each piece crafted in our company. We are an eminent Floral Applique Gown Bodice supplier of our domain. 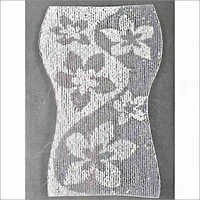 These gowns are developed with extensive use of applique 3 dimensional flowers. 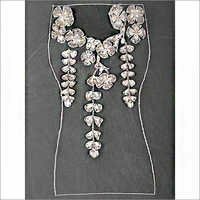 The flowers are highlighted with hand sewn Swarovski crystals and Czech beads. 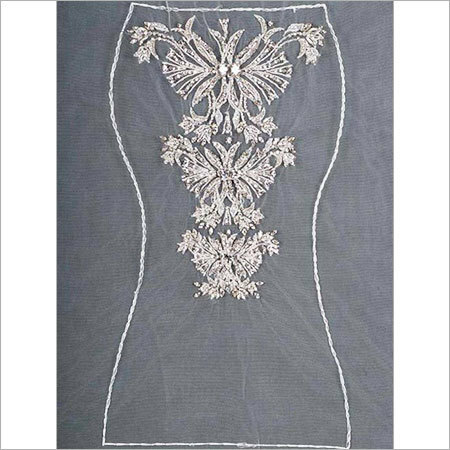 We are offering Bridal Designer Bodice Panels that present stylish as well as sophisticated looks. This bodice panel is made up of the finest grade fabrics, clear crystals, Swarovski stones, Japanese shining pearls, Czechs& glass beads. As this design is more in demand from our clients. 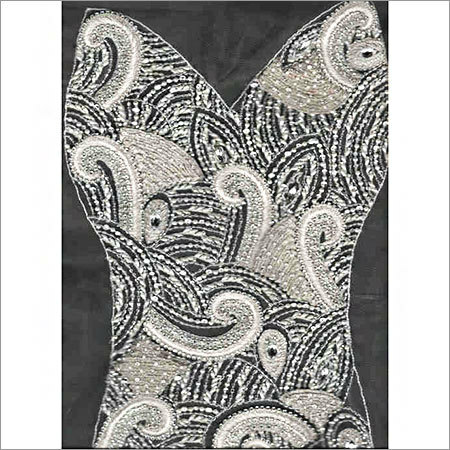 Materials Used: Swarovski crystals, pearls & stones, Czech & Japanese shining pearls & sequins. We offer elegant looking Feather Bridal Gown which is well fitted with swarovski crystals & diamante. Our skilled craftsmen leave no stones unturned while designing this product range. 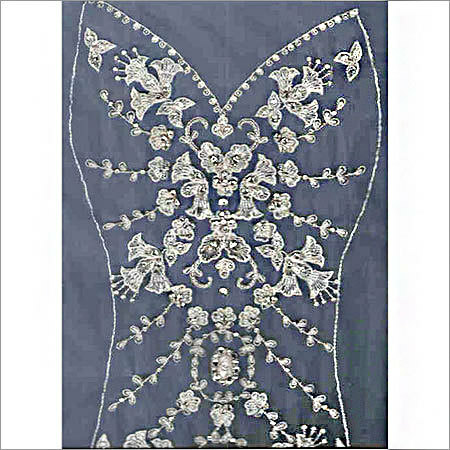 Our workforce specializes in high-end fashion fabrics and embroideries particularly for bridal wear. 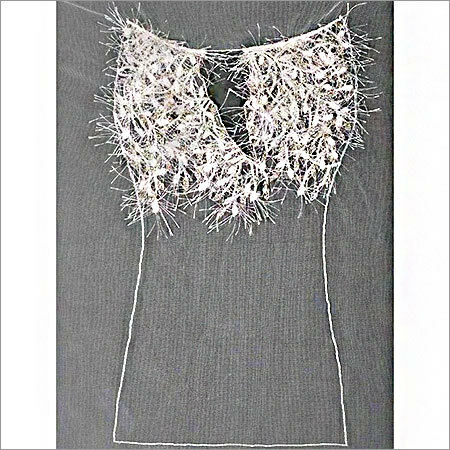 This designer Bridal Bodice Panel is beautiful as its inspiration is modern abstract art. It is made up of Swarovski white pearls with crystals & its beauty reflects our skilled craftsmanship. 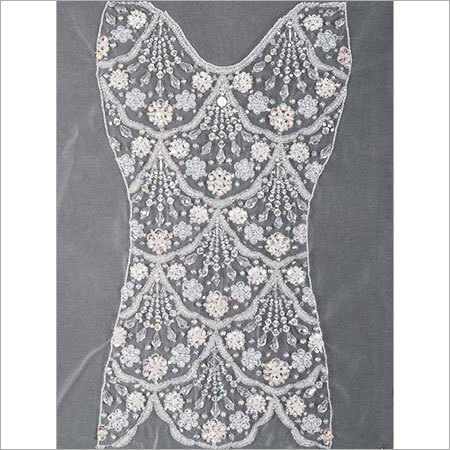 Color: white, Blue, , can be made in any color..
Materials Used: Swarovski pearls with crystals, Czech & sequins. 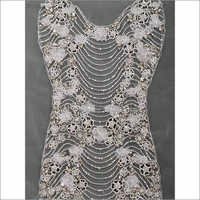 To design and develop our range of Embroidered and Beaded Bridal Gown, we make use of finest quality materials, which is obtained from the most reliable vendors of the industry. 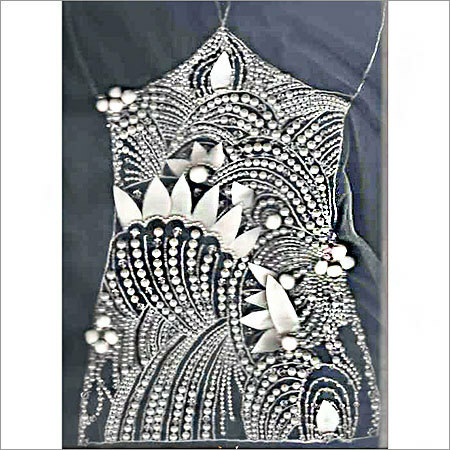 These gowns are elaborately fabricated using swarovski diamante & czech beads. 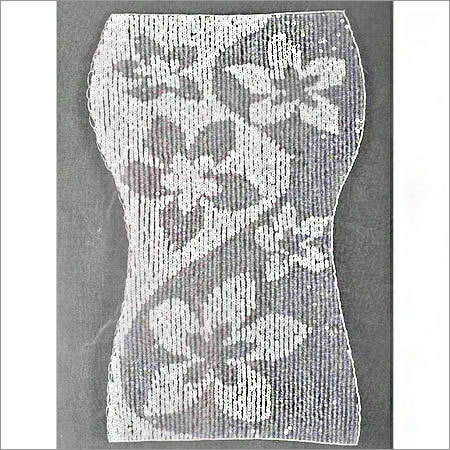 It possess some applique flower & cut design to add some more glory to the bodice. 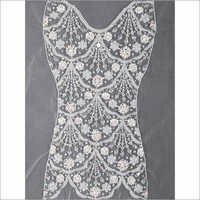 Our range of Crystal Beaded Gown is highly appreciated and demanded by our valued clients across the Indian domestic market. 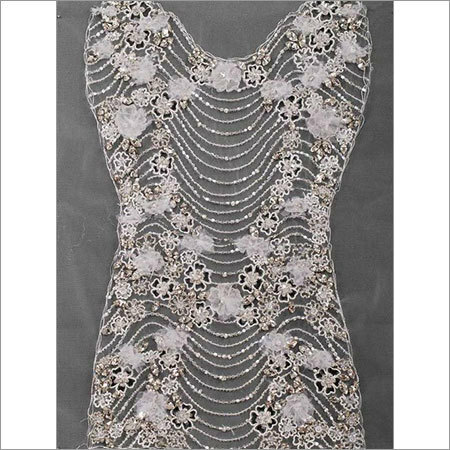 Our designed gowns are iced with Swarovski & preciosa crystals. 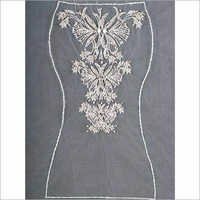 In a short span of time, we have gained immense popularity due to various salient attributes for instance clients like our offered gowns as they are completely hand embroidered and beaded. 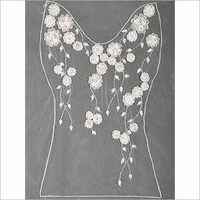 Floral Applique Gown or bodice has made of applique 3 dimensional flowers. It is a flower burst design. 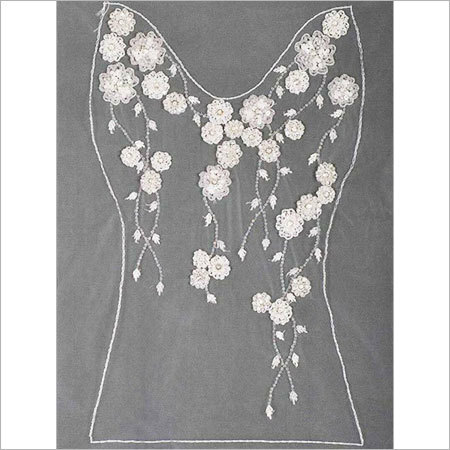 The flowers are enhanced and highlighted with hand sewn Swarovski crystals and Czech beads gown.